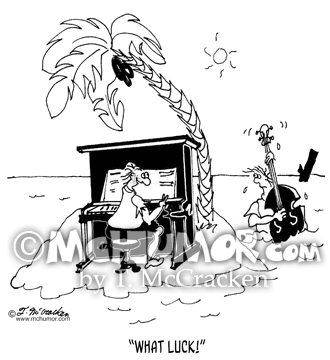 Music Cartoon 5820: A band stranded on a desert isle, seeing a bass player float by crying, "What luck!" 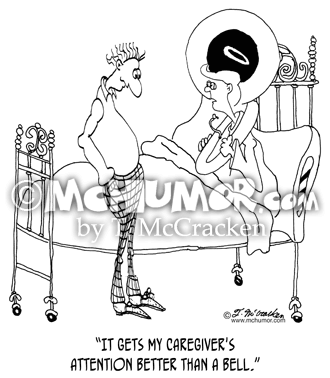 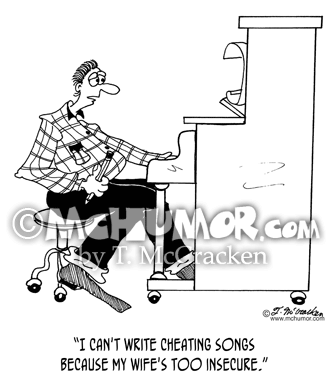 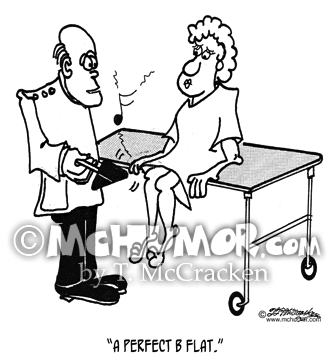 Marriage Cartoon 5070: A country musician says, "I can't write cheating songs because my wife's too insecure." 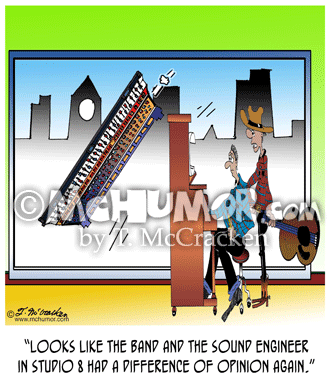 Music Cartoon 8248: Looking at a mixing board falling from an upper story window a musician says to another, "Looks like the band and the sound engineer in studio 8 had a difference of opinion again." 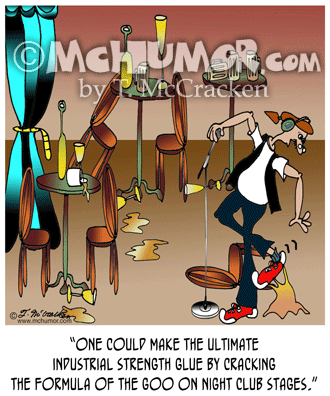 Adhesive Cartoon 7573: A sound engineer who's shoes are stuck to the ground on a stage says, "One could make the ultimate industrial strength glue by cracking the formula of the goo on night club stages." 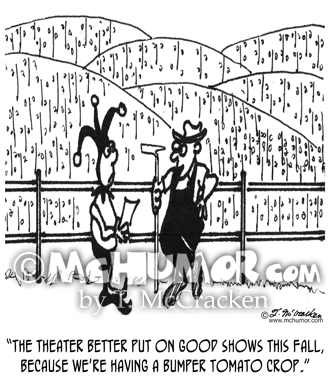 Theater Cartoon 3224: A farmer warns an actor, "The theater better put on good shows this fall, because we're having a bumper tomato crop." 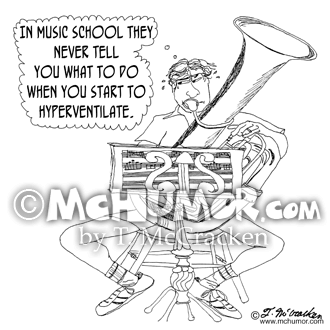 Tuba Cartoon 0030: A bass tuba players thinks, "In music school they never tell you what to do when you start to hyperventilate." 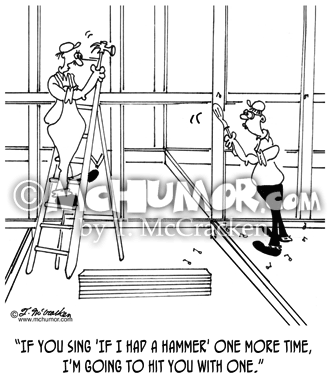 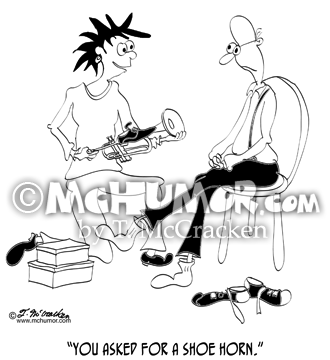 Carpenter Cartoon 6391: A carpenter says to another trying to nail something in using a screwdriver, "If you sing 'If I Had a Hammer' one more time, I'm going to hit you with one." 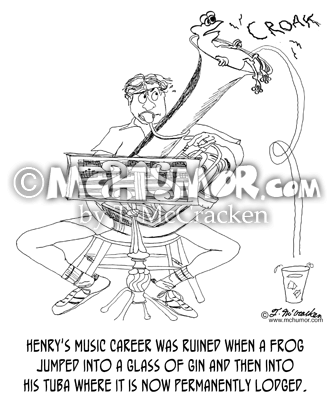 Flying Cartoon 3160: An airplane cockpit with a cello, French horn and harp are at the controls. 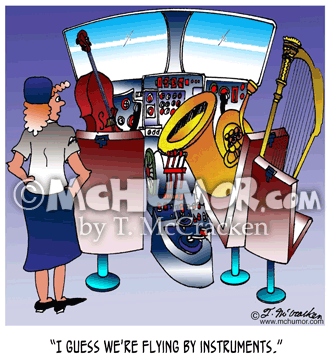 A stewardess says, "I guess we're flying by instruments." 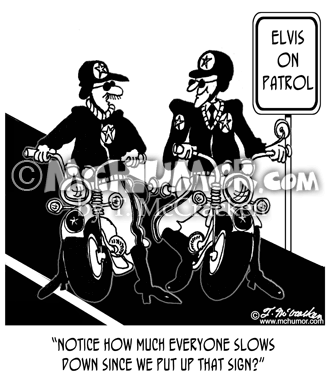 Elvis Cartoon 6270: A road sign that says, "Elvis on Patrol." 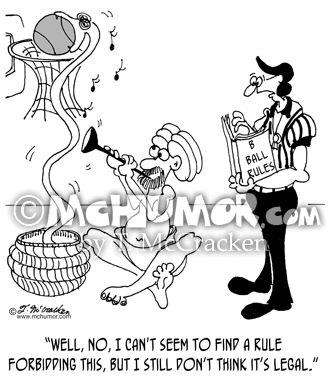 An officer says: "Notice how much everyone slows down since we put up that sign?"